Niche perfume line established by Fabrice Penot and Eddie Roschi (both formerly of Giorgio Armani fragrances) in 2006. Le Labo started with 10 fragrances by well-known perfumers, and is known for blending the essential oils with alcohol and water at the time of purchase and providing customized labels for the bottles. Initial releases in early 2006 were Fleur d'Oranger 27, Jasmin 17, Labdanum 18 (originally Ciste 18), Ambrette 9, Iris 39, Bergamote 22, Rose 31, Vetiver 46, Patchouli 24 and Neroli 36. In each case, the number in the fragrance name refers to the number of notes that make up the scent's composition, and the name is taken from the ingredient in the highest concentration; to take one example, Jasmin 17 has 17 ingredients, with jasmine being in the highest concentration. The names are thus not necessarily related to what the fragrance is meant to smell like. Le Labo also makes candles, The Laundress Le Labo Rose 31 detergent and the Le Labo Olfactionary. In 2009, Le Labo developed a fragrance in collaboration with French ready-to-wear line Zadig & Voltaire, Tome 1 La Pureté. In 2014, Le Labo was acquired by Estee Lauder. Recent releases include Oud 27 (2009), Another 13 (2010), Belle du Soir, Chant De Bois, Orange Discrete, Poudre D’Orient and Bouquet Blanc (Anthropologie, 2010), Ylang 49 & Lys 41 (2013), Geranium 30 (2014), Thé Noir 29 (2015), Colette 19, Colette 25 & Colette 34 (2017), Tonka 25 (2018). Tubereuse 40 (2006) was the first in a series of city-exclusive fragrances; it is sold in-store in Le Labo's New York venues only (no phone or internet orders). Later city-exclusives include Aldehyde 44 (2006, Dallas), Vanille 44 (2007, Paris), Poivre 23, Musc 25 & Gaiac 10 (2008, London, Los Angeles & Tokyo respectively), Baie Rose 26 (2010, Chicago), Limette 37 (2013, San Francisco), Cuir 28 (Dubai, 2013), Benjoin 19 (Moscow, 2013), Mousse de Chene 30 (Amsterdam, 2017). Many years, the city exclusives were made more widely available for a limited time (6 weeks), otherwise, the only way to get one is in the city in question. Le Labo fragrances are available at Luckyscent, through the brand's website or at the free-standing boutiques in Nolita (New York), Los Angeles, London or Tokyo; at Barneys in NYC, Las Vegas, Beverly Hills, Chicago, San Francisco or Dallas; at Colette in Paris; at Liberty in London. You can see a complete list of boutiques and counters on the brand website. 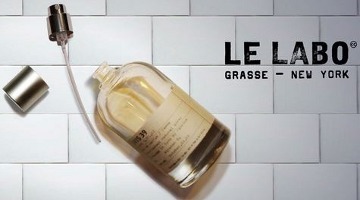 See all articles on Now Smell This tagged Le Labo.